A 2-year-old girl is about to be airlifted by a Los Angeles County Fire Department Medevac helicopter from a Valencia park to a San Fernando Valley hospital after she nearly drowned at the Northpark community swimming pool early Thursday evening. Photo: Ryan Gilley/Two8Nine Media. A 2-year-old girl found floating face down in a Valencia community swimming pool was revived early Thursday evening by bystanders who performed CPR. Swimmers at the Northpark Community Pool in the 28200 block of Northpark Drive near Copper Hill Drive noticed the girl floating face down in the crowded pool around 7 p.m., according to eyewitness reports. When bystanders pulled the child out of the water, she was unconscious and not breathing. Several bystanders performed CPR on the girl and she began breathing again, LACoFD Captain William Edwards said later at the scene. 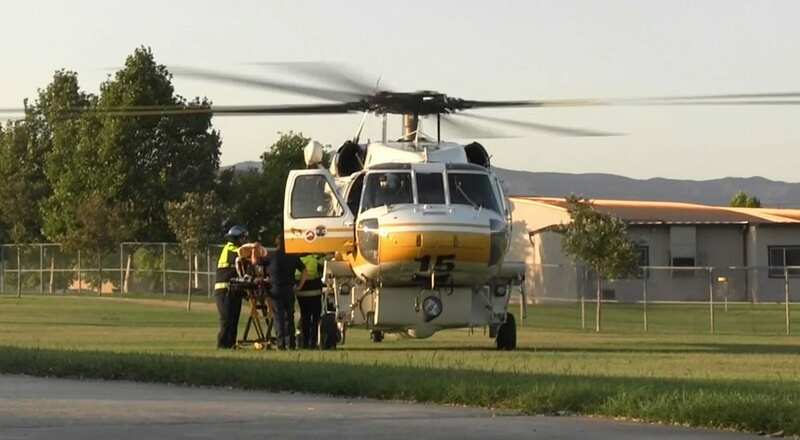 After the toddler was revived, but not yet fully conscious, paramedics took her to nearby West Creek Park, where a Medevac helicopter flew her and her mother to Northridge Community Hospital in the San Fernando Valley for further treatment. So glad she’s okay! Wondering where were the lifeguards?